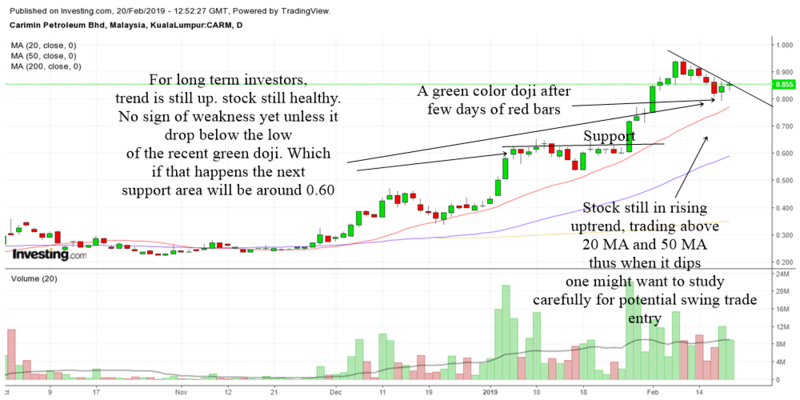 In this article we will seek to analyze the price of Carimin through technical analysis. Do note that I will not be looking at the fundamentals. So you will have to study them yourself and complement it with the technical analysis contained here. I think oil and gas stocks are some of the hottest stocks in Malaysia today. Carimin is one of them and the massive rise today can be attributed to the massive rise in oil & gas stocks in the US. Therefore there is a lot of value in looking at the US market because you can often gain clues from it. 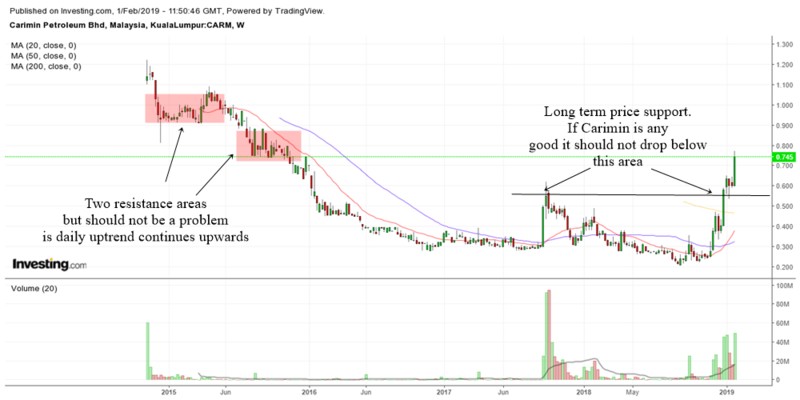 Today I have put in the daily chart, 60 min chart and weekly chart of Carimin so that you can see the short term, mid term and long term outlook of Carimin. I think along with Dayang, this oil stock fell. 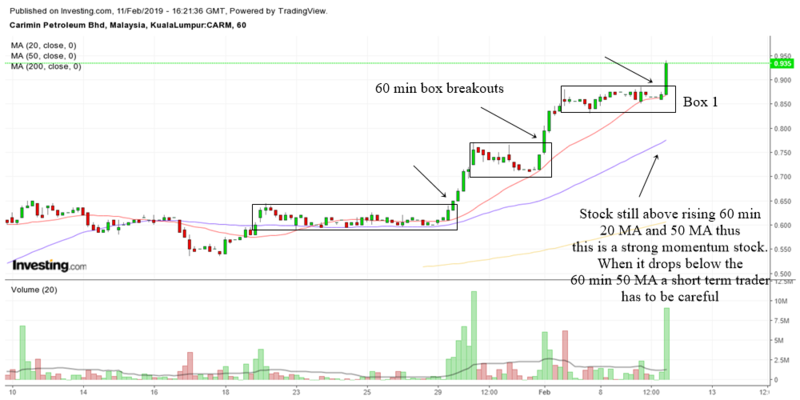 Yesterday I pointed out the box that Carimin made in the 60 min chart. For those of you who know my method, a box is an area of fight between the bulls and the bears. 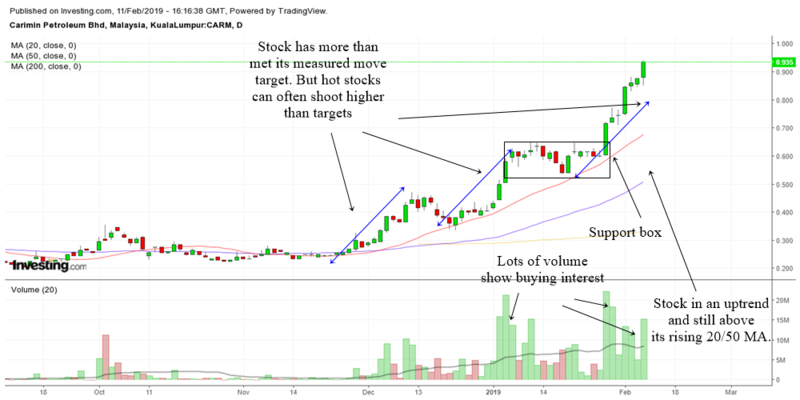 If the stock goes above the box, then its likely to go higher. The bulls have won. Today the stock went below the box and thus the selling. 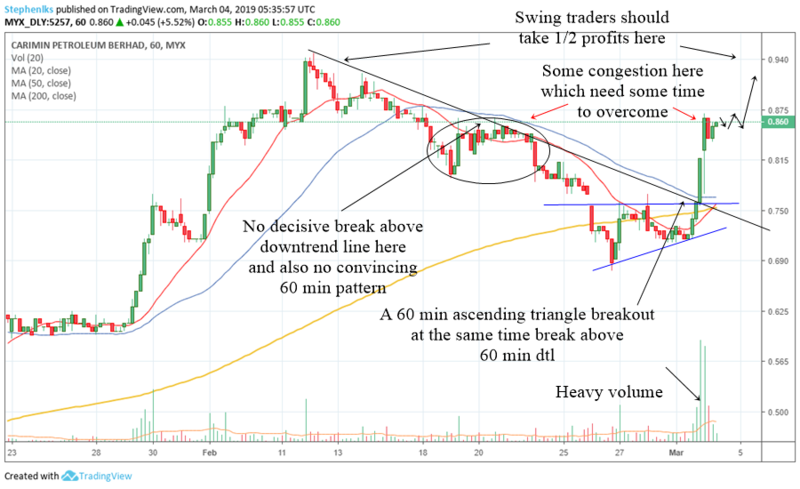 The uptrend in the 60 min chart is still alright as long as it stays above the uptrend line I have drawn but once it drops below it you should expect lower prices. As I mentioned in my last posting, this stock is still in an uptrend and one should study it carefully to find swing trading opportunity. Stocks that are in an uptrend can often give nice trades. It can take the form of buying the dips or buying the consolidation breakouts. 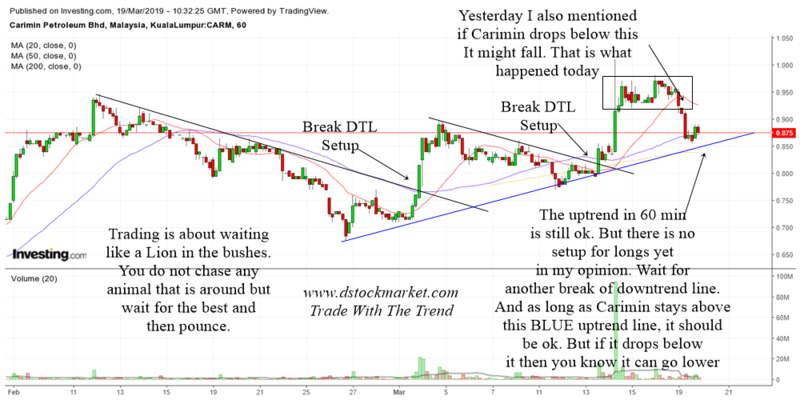 In the case of Carimin, the stock recently gave a buy the dip trading setup. It is not easy to buy the dips as we just don't know when the stock wants to stop dropping. Therefore, trading strategies are essential to help us target the stock for the best entry. Which is why it is not advisable for people to go into stocks without a valid trading strategy. All commentaries are useless if one does not follow a strategy. Even with a trading strategy, one should not expect 100% success rate all the time. A success rate of 60-70% is good enough for the long run. Combine it with good risk reward, then it will yield quite a lot for the trader. I did comment on this stock recently but it was in the Malaysian stock market commentary. Today I will put it again in its own designated column. The chart above is the daily chart of Carimin. There were 3 daily setups I have annotated in the chart. The first one being a break the downtrend line, the second one being the breakout play and the latest one is once again a break the downtrend line setup. 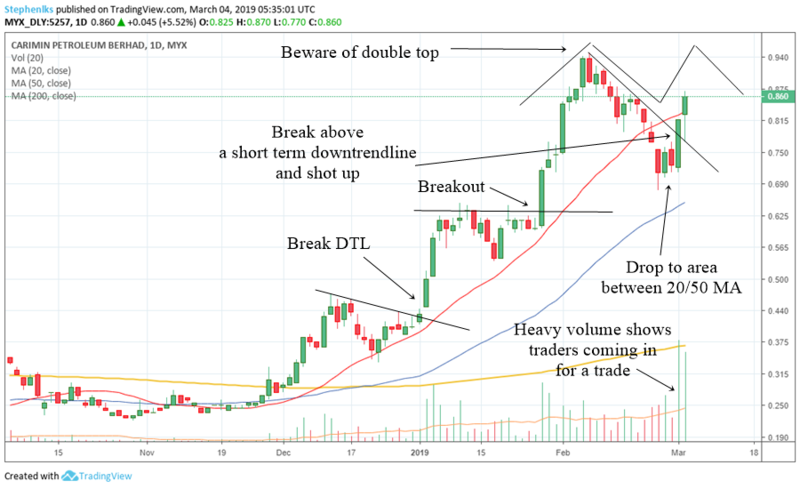 I'm sure there are many other types of setups to different type of traders but the point is when a stock is in an uptrend, there are indeed plenty of setups if you just learn how to spot them. The recent setup is still going on. But one should be aware of a possible double top. 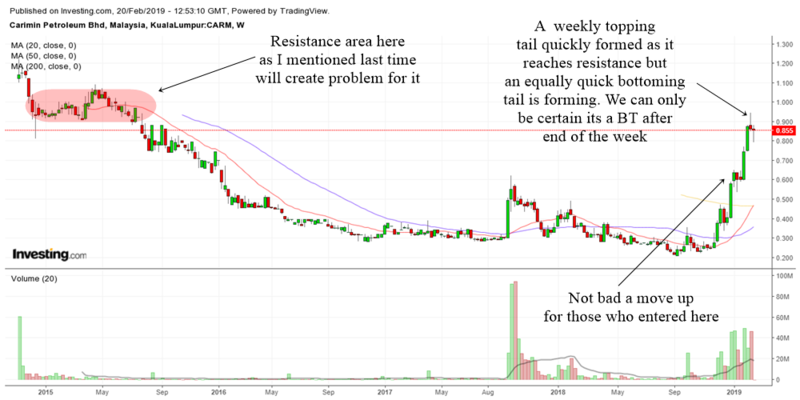 Not to say that the stock will immediately reverse when it reaches the previous high, but for swing traders, they should take at least 1/2 of their positions off when the stock almost reaches its previous high. Sometimes a stock does not drop to a support area before reversing. Notice how Carimin stop dropping slightly above the previous breakout area which is the price support. That's the strange thing about stocks. Carimin was in the 20/50 zone. This is where a stock that is in an uptrend and corrects to the area between the rising 20 MA and rising 50 MA. Usually, you can often find trading setups here. Where and when did the latest swing setup happen? For that we need to zoom down into the 60 min chart. 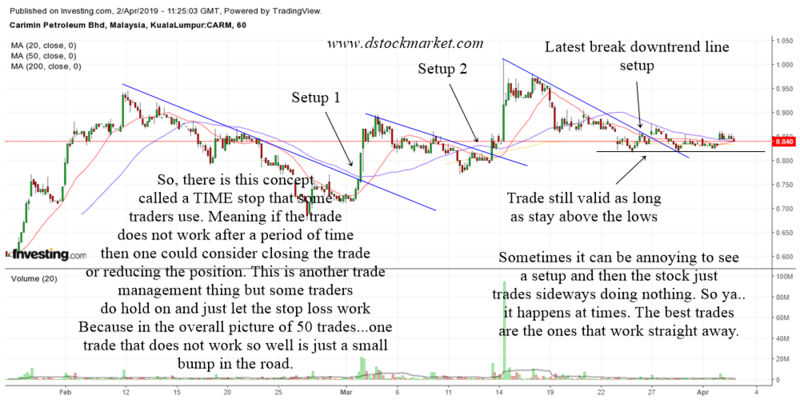 I like to use the 60 min chart as it is neither too long nor too short. 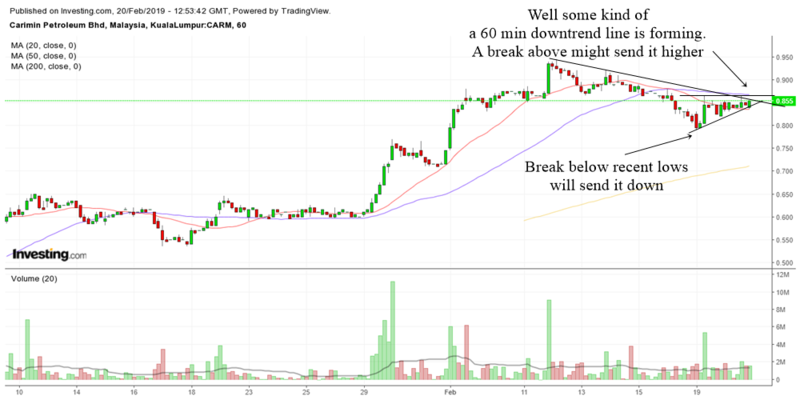 The chart above is the 60 min chart of Carimin. I did highlight a possible reversal in my past analysis but the stock did not breakout of the downtrend line convincingly. Neither was there a bottoming chart pattern in the 60 min chart. Which is why the stock continue to fall. Carimin drop to around the 60 min 200 MA which can often act as a support area. More like a psychological support area in this case. 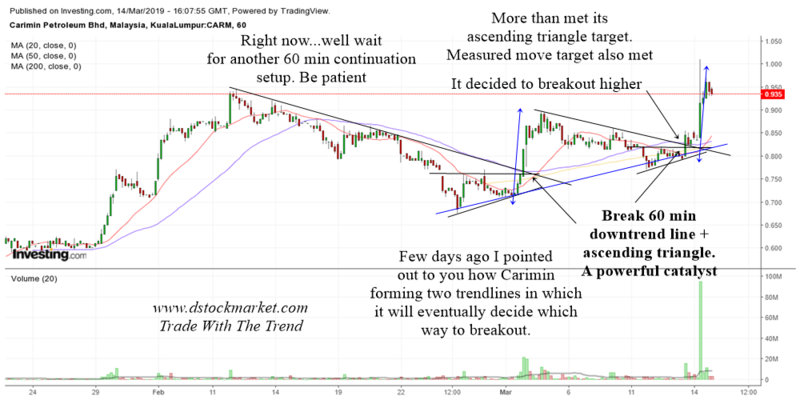 A 60 min ascending triangle formed and at the same time the stock broke above a 60 min downtrend line. You can see how some traders noticed this pattern and immediately piled into this stock. We know they noticed it because of the increased volume as the stock broke out. The stock is still in a 60 min uptrend and those who played the 60 min ascending triangle breakout is already in the green. There is some slight congestion on the left which needs some time to be overcomed which is why the stock is moving sideways a bit. We really do not know how high the stock will go in this swing trade. It might even reverse back down. There are no certainties in trading but good trade management will help a trader to avoid big losses. Those who are positive now should raise their stop loss to break even. Try and find a 15 min setup. When the stock reached the previous high (which is the possible daily double top) they should take at least 1/2 of their profits off the table. Perhaps the stock may trade sideways a bit when it reaches that area. After that it may break higher. 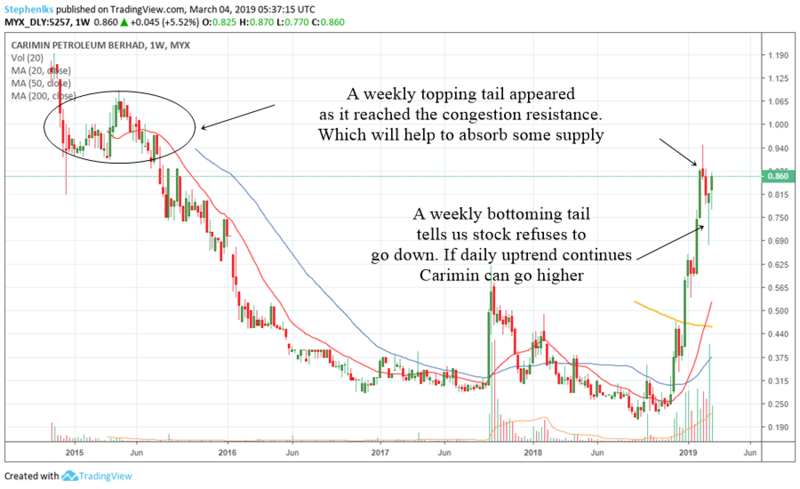 Let's take a look at the weekly chart of Carimin now. Well, looking at the left, there is indeed a large congestion area. But the stock may have absorb quite a lot of the supply when it trade to that area. A weekly topping tail formed which tells us there were quite a lot of people selling. After the weekly topping tail appeared, the stock dropped quite a lot. This tells us that the stock rejects to go lower. The presence of a weekly bottoming tail in an uptrend stock can be a good sign that it wants to continue to move higher. The lows of the bottoming tail can also be a reference point for longer term holders. If the stock is to resume going up in the long run, it should not drop below the lows of the bottoming tail. The last time a weekly bottoming tail appeared in this stock was around the 2nd week of January 2019. From there it shot higher by quite a lot. So perhaps this time it may repeat the same thing. But as always, only trade when there is a valid trade setup and a good trade management is always needed. Kari Mee is still in an uptrend. So far from an investing point of view it is experiencing a normal correction. But do be careful if it drops below the lows of the recent green doji. In just about 10 days the stock has climbed up drastically. I like to use the measured move as a potential target. As you can see in the chart below, the stock has more than met its target for this round of breakout. Targets are just targets and a hot stock usually rises and rises and go beyond the initial target. Which is why if a stock is in a confirmed uptrend, one can be a bit slow to sell. Trader management such as selling 1/3 or 1/2 are keys to capture such profits. Plus one could also use the 60 min chart for better timing. 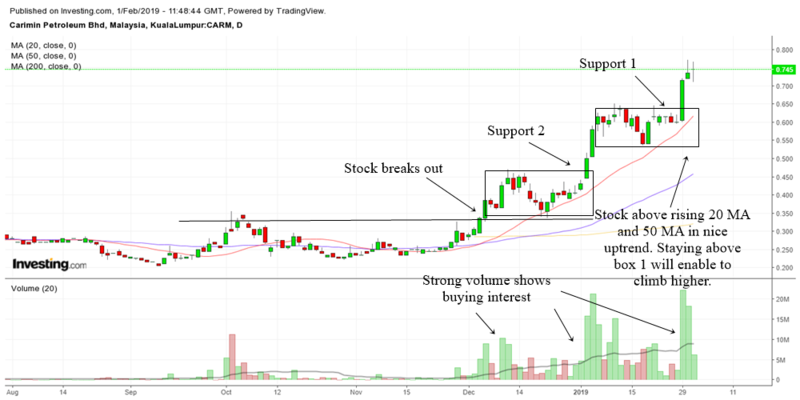 Since the stock is still in a daily uptrend and still trading above its rising daily 20 MA and 50 MA, one can continue to expect the stock to continue to go higher. This is the way to make money in an uptrending stock for traders. Investors are usually in long time ago. The heavy volume above shows there is buying interest. Either from investors or from traders. Let us now examine the stock in the 60 min chart now. As you can see from the chart above, the stock is also in a nice 60 min uptrend with price trading above its rising 60 min 20 MA and 50 MA. There are a few breakouts with the latest one yesterday. A stock trending strongly in the 60 min chart will rarely drop below its 60 min 20 MA and 50 MA. Therefore a short term trader should be careful every time it drops below the 60 min 20 MA. If it drops below the 50 MA, chances are there is a correction coming either by a sideways trading or the painful correction by trading downwards to support. Last of all, let us study the weekly chart again. The stock has certainly gone up quite a lot since December 2018. Right now it is at an important resistant area. This resistance area and also the psychological $1.00 area will perhaps provide some challenge to this hot stock. Therefore one should start to expect some sideways consolidation. Does not mean it won't shoot pass this area but one should not forget important resistant areas. I do believe some sideways trading would be good for the stock as well. That way it can breakout higher later and make new all time highs. If it makes new all time highs then we can expect the stock to move higher and higher until it does not want to go any higher. A look at the daily chart tells us that it is in a nice uptrend. Reminiscing me to the days in 2017 of what the Dow and S&P looks like. LOL. Whether its a Malaysian stock or a US stock or index, the principles are the same. Indexes and stocks that are above their rising 20 MA, 50 MA and 200 MA are in an uptrend and will most likely continue to go higher until it does not want to go higher. The daily chart of Carimin above shows us the stock had many breakouts. The broke out that ignited the new uptrend was in December 2018. From there it continue to rise giving traders and investors opportunities to participate in its rise. I do see some trade setups but that is a story for another day. More appropriate for the Trading Strategies section. What I am doing here is to analyze the trend and buying interest. Investors should look at box 1 and box two that I have drawn. These are support areas. A healthy uptrending stock will rarely drop below its boxes. And it will rarely drop below its rising 50 MA. So do keep these things at the back of your mind. 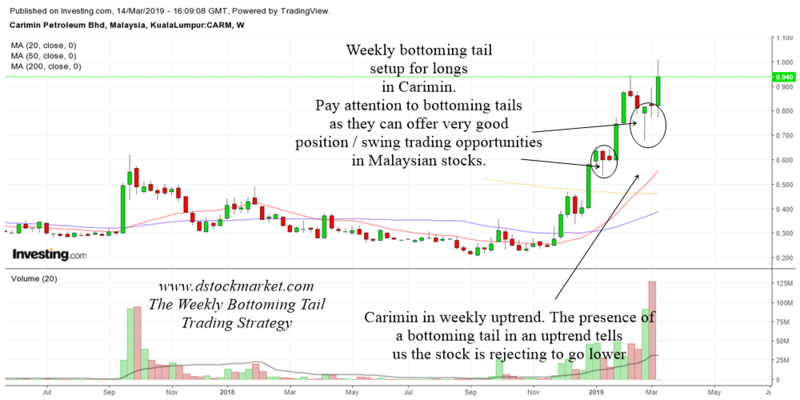 Next let us have a look at the weekly chart of Carimin. The stock is indeed in a nice weekly uptrend as well. The important area to recognize is the previous high made in September 2018. Previous highs once overcome will act as support. 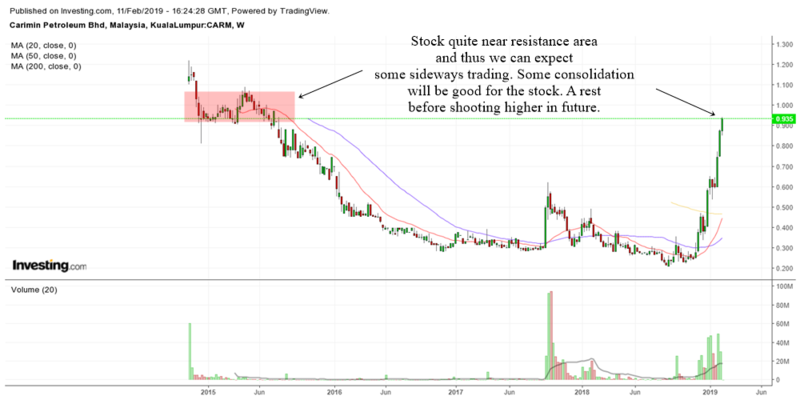 If this stock is any healthy and is to move higher in the long term, it should not drop below this area. There are some resistance areas which I have highlighted in red. But that should not be a problem as long as the daily uptrend is intact. But I do expect some rise and fall type or if that does not happen it rises and consolidated and breakout higher. Which does not matter that much for the trader. Either he buys the breakout or buys the dip. As long as the uptrend continues that is the way to make money trading stocks.